Awakening to a cool sunny morning after a day and night of cold rain, I set out on the 70-mile drive to Ventura Harbor. 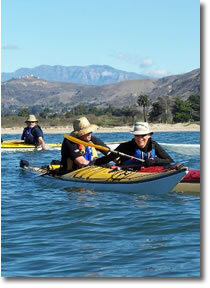 It was to be my first kayak adventure with CKF (California Kayak Friends). Mike Condit had graciously offered the use of his Looksha IV since my first kayak was on order and would not arrive for several weeks. The sun sparkled on beads of water on my windshield while wisps of mist began to rise from the pavement as the sun rose in the clear blue sky. Having only one short lesson and a few rentals under my belt, I was unsure how I'd fit in with a seasoned group. But I knew enough to get back in a boat with a paddle float and since this was a round trip I figured maybe I could cut it short if I couldn't keep up. Arriving at the launch site I was unsure what to expect. 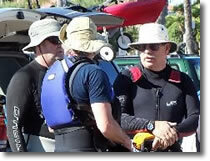 Soon I found a busy group of wet-suit or hydroskin clad folks. They were of all sizes, shapes, and ages, with clothing of varied colors. The one thing they all had in common is they all wore funny-looking hats! They were busy as bees unloading shiny colorful boats from the top of SUV's. Some had slick rollers to assist with the job, while one was perched atop a big aluminum stepladder. They didn't notice me pulling in because I had no SUV with kayak perched on top - just a guy in an ordinary car. After finding Mike, the adventure began. He got me all set up, showed me how to do right some things I had been doing wrong, and shoved me off the concrete launch ramp into the still harbor waters as the folks with fancier boats launched from the docks. As we paddled past the breakwater I didn't know what to expect. But everyone chatted casually and Mike made sure I felt at ease. The paddle up the coast was a lot of fun - bobbing in the waves, enjoying the salt spray, the view, and the blessed freedom from pager, cell phone, and pressing responsibilities. I enjoyed watching others disappear, appear, and then disappear again behind a swell. They all still wore those funny-looking hats. Soon I realized they looked very comfortable and if I'm going to be at home on the water I'll want one too. I'm told I can't qualify to own a genuine Tilly though until I'm 50, but that's okay: there will be plenty of other kayak goodies to acquire in the meanwhile. After a somewhat comical break for a snack we headed back. Mike had mentioned hugging the shore on the way back so I headed in that direction. Soon a sleek yellow boat passed inshore of me. I thought it was Mike so I figured everyone else was right behind us. But the yellow boat went on ahead at a pace I could not match. It was then I realized the owner's funny-looking hat wasn't Mike's funny-looking hat. I located the rest of the group farther out to sea and figured I could paddle out to join them (making my journey longer) or take a direct route to the mouth of the harbor, which I did. It was quiet and I missed out on some good companionship, but I got a taste of solitude on the ocean. Well, I wasn't all that far from the group, conditions were mild, and I wasn't on some long open-ocean crossing. But to a beginner it was a new adventure and it gave me a small measure of confidence and independence. The sun glinted flip-flop upon the translucent yellow paddle of the sprinter who had gone ahead - a bright steady beacon. I met the sprinter at the harbor entrance and paddled on in with him - not knowing that the procedure was for everyone to regroup and count heads (or funny-looking hats) before heading in. I didn't want to get out of the boat when we got back! 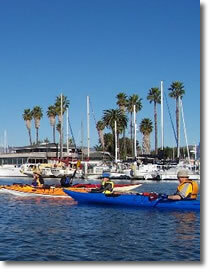 The day's adventure was fresh on my mind and it would have been great fun to practice new skills in the quiet harbor. But life's responsibilities beckoned, as I had kids to pick up and other things to take care of. Besides, I was grateful to Mike for the generous loan of his boat and it wouldn't do for me to steal away with it! As I drove home I thought of the day when my own boat will arrive and I can once again join those friendly people in funny-looking hats for another fine adventure.